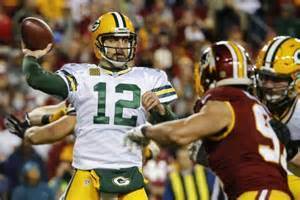 Here are several stats you may not know from the Packers 35-18 win over the Washington Redskins in their first-round playoff game on January 10, 2016 (the stats all reflect playoff games unless otherwise noted). The 35-18 final score was only the second time in NFL history that score was the final tally of a game. Ironically, the other time was also a playoff game; it happened on January 1, 1995 when the Chicago Bears defeated the Minnesota Vikings 35-18 in a Wild Card game. The Packers are now 4-8 in playoff games versus the NFC East, 2-6 on the road. In all road playoff games since 1966 (start of the Super Bowl era), the Pack is now 8-11. Prior to yesterday’s win over the Redskins, they had lost three of their last seven road playoff games in overtime. Yesterday was the second time in Green Bay playoff history that they gave up a safety. The other time was in 1994 to Detroit in a 16-12 win over the Lions. The Pack had zero points at the end of the first quarter. They had lost four of their last six when they were scoreless at the end of the first period. They are now 6-6 in such playoff games since 1966. Aaron Rodgers had a pair of TD passes in the game. The Packers are 5-3 in games when Rodgers has two or more TD passes in a playoff contest. Green Bay had a six-point lead at halftime; they are now 19-3 since 1966 in playoff games when they hold the lead at half; they are 6-3 in road games with the lead at halftime. There is logic to giving the ball to Randall Cobb as a running back… of all players with 50 or more rushing attempts (in all games, regular season and playoff), Cobb ranks 15th all-time with a per attempt average of 6.9 yards. Curtis Conway tops this list with a 9.3 yards per carry average. James Jones became the 12th Green Bay receiver to have seven or more catches in a playoff game since 1960. Robert Brooks, Greg Jennings and Jordy Nelson top the list with three playoff games each with seven or more catches. The Pack had the lead going into the fourth quarter and is now 23-3 in playoff games since 1966 when they are ahead going into the final period. Green Bay had 141 yards rushing in the game. They had been 4-7 in their last 11 playoff games when they accumulated 100 or more rushing yards. They are 17-9 all-time in playoff games with 100 or more yards rushing. The Pack is now 13-2 in playoff games when they score 30 or more points; they are 16-1 in post-season contests when they allow under 20 points to their opponents. The only loss was in 1972 when they were defeated in the playoffs 16-3 to the Redskins. Since 1966 the Packers are 9-1 in playoff games where they have two or more rushing TDs. Dom Capers’ defense had six sacks in the game. The team is 6-2 in playoff games when the defensive unit collects five or more sacks. The Packers had only one turnover (a fumble late in the game by Eddie Lacy). They are now 18-4 in playoff games since ’66 when they have one or no turnovers. Rodgers had a QBRating of 93.5 in the game. In his 12 post-season starts, he has had a QBR over 90 in nine games; the Packers are 6-3 in those games. Green Bay is now 6-1 in playoff games where Rodgers does not throw an interception (he had zero yesterday). The offensive line allowed only one sack of Rodgers in the game. In playoff games since 1966, the Packers are now 14-7 when they allow one or no sacks. Washington had only 84 yards rushing on 18 carries in the game. The Pack is 15-2 in the last 17 playoff games when they keep the opposition under 100 yards rushing. Eddie Lacy had 63 yards on 12 carries and James Starks had 53 yards on 12 carries. It was the first time since a playoff game in 1997 when the Packers had two players amass over 50 yards apiece rushing in a playoff game. It has happened five times since 1960… the Pack is 5-0 in those games.